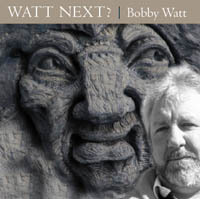 Watt Next? asks the title of this brand new recording. Good question, since most people would raise an eyebrow at a collection that includes songs by Robbie Burns and Bob Dylan, The Battlefield Band and The Eagles, traditional Scottish tunes and four noteworthy originals by the singer and his collaborator, Toronto performer and club talent booker Holmes Hooke. In addition to the moving Remembrance Day, Watt and Hooke wrote a gentle country love song, Hold Me Close; Paddy Donovan is the tale of a fixed verdict at a pipe band competition (shades of Canadas ice skaters at the Winter Olympics!). Youd Never Sing the Blues is a touching tribute to Jackie Washington, the 81-year old Hamilton-based singer and entertainer. Watt Next?" is a summary of the full and productive life (to date) of a man who has become the master of two separate professions, and who somehow manages to make the touch of stone and the heart of music as permanent as time itself. Produced by Bobby Watt and James Stephens (who also adds fiddle, mandolin, harmonium, kazoo and backing vocals) at Stove Studios in Chelsea, Québec, the album also features the fine playing of guest musicians Danny Artuso (pedals steel), Kevin Evans (guitar), Duncan Gillis (whistles, small pipes), Ben Grossman (percussion), Vince Halfhide (National steel guitar), Don Kavanagh (harmonica), Tom Leighton (accordion, piano), Andy Moore (Highland pipes), Peter Von Althen (drums) and David Woodhead (bass). Watt backs himself on guitar, bouzouki and tribal drum.